A seasonal favourite of mine, although we are far from the month of October. Fairly simple, but highly effective. A clear base coat to begin with. I then coated a triple layer of plain white – this was mostly because my white was pretty rubbish at the time of doing these. I do think its most effective when a solid block of white, extraneous brush strokes can diminish the overall effect. Once dry, I used a small amount of nail polish remover to take off the tips of white – this can be done with sections of tape as detailed in the last post (Converse Nails). If using nail polish remover, I find it easier to fold apply to a cotton wool pad and fold it in half to give the straight edge needed. It is essential to have a substantial amount of remover when using this technique, as a lack of can cause smudging and fraying of the fine edge desired. I then used a blood red polish, free-hand, to fill in the tips. With a little polish on the brush edge (you may need to practice a little to find the right consistency), I gently dragged and dripped down my nails, to create that bloodied effect of a zombie desiring brains. There doesn’t have to be a particular style to this, just do whatever you feel looks best. The great thing here is that the more uneven and messy, the better it looks! And finished off with two layers of top coat. I really like this design, as you can really have fun trying out different styles to see what looks best. 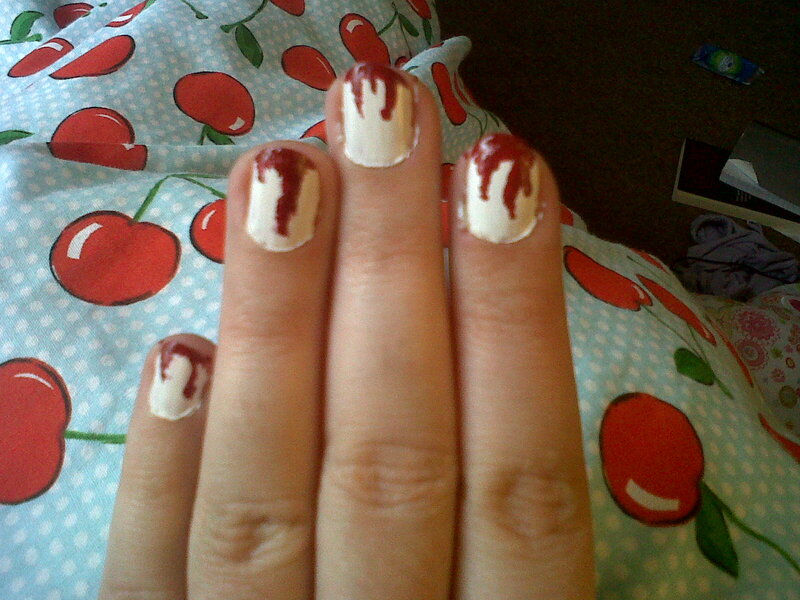 I’ve been doing this for Halloween for a few years in a row now, using different base colours but keeping the same blood-red tip. 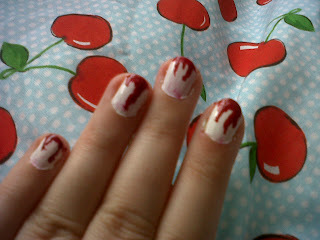 My first attempt was with a black base, which looks good but you can easily lose the gory tips. Try different colours for both elements of the design – experiment with what works best with your costume!